Yesterday was AWESOME! – From the end of bag. 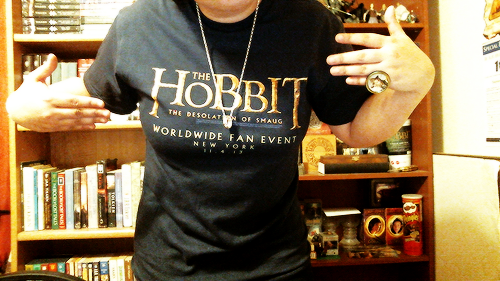 The Hobbit Fan Event was yesterday and I attended the one in NYC. IT WAS AMAZING. I had so much fun. I was pretty nervous because it was my first official duty as a reporter for Middle-earth News and I went alone. I didn’t know anyone but I started talking to the people in line and it was lots of fun. It’s a fan event, so I wanted to be with the fans. I saw great cosplays, talked to fellow fans and shared many laughs. 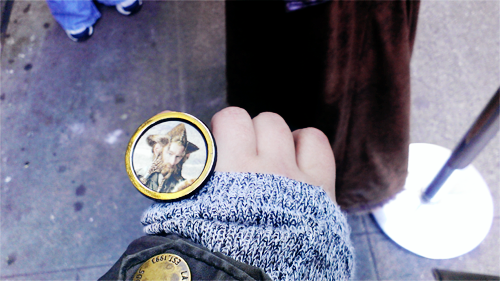 Got myself a Nori ring from a woman named Deejay who was thoughtful enough to give out buttons and rings to everyone in line. I was in line hanging out for about 5-6 hours and it was COLD. We were outside in the shade in the middle of autumn in New York City. Not the most comfortable environment but you know what? Everyone seemed to be having a fun time. We were all just so excited to be part of this event. I was seated with press and it was pretty surreal. Me as press? How has that happened? Not going to lie, I felt pretty cooool. We all received complimentary popcorn, refreshments and t-shirts! The actual event was awesomeeeee. Not only did we get to see the latest production video, and credits song for DOS (which I personally love) but we -everyone in the theaters- saw 20 minutes of footage! I really really enjoyed it. It definitely got my pumped to watch the next two films. My first experience as a reporter “on the scene” was very nerve wracking but overall very cool. I will be posting a full article on my experience on Middle-earth News tomorrow including some information on the footage that the public didn’t get to see. Previous Article Hobbit fan event tomorrow!!! !